WTM 2011 saw visitor numbers go up by a massive 14% compared to 2010. With over 23,000 participants the Sri Lanka pavilion drew a large number of trade and consumer visitors on the first three days of the show. 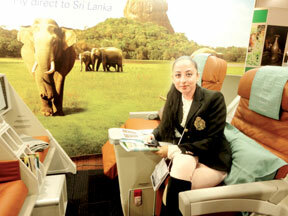 SriLankan Airlines showcased a model of the upgraded business class product which would be in line with the introduction of the new and improved fleet. Chairman, SriLankan Airlines Nishantha Wickramasinghe said, "With the re-introduction of Zurich to our route network in December 2011, we are confident that Europe will remain a strong market for the airline and the destination, despite reports of a possible economic turmoil. The demand for Sri Lanka as a destination is on the rise and we are pleased to offer visitors the connectivity and capacity through the airline's network and the code share alliances".